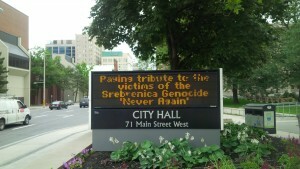 On the occasion of the memory of the genocide against Bosniaks from Srebrenica, at the proposal of the Institute for Research of Genocide, Canada, the Congress of North American Bosnianks and the Bosnian Islamic Centre of Hamilton, with the Hamilton city mayor’s decision on a prominent electronic sign located outside of City Hall is posting brief message recognising the Srebrenica remembrance Day in Hamilton. Sending a clear message to future generations to say ‘Never Again’. On Friday July 10 the Mayor of Hamilton Fred Eisenberger will address Councillors Meeting with special speech to commemorate the 20th Anniversary of the Srebrenica genocide. 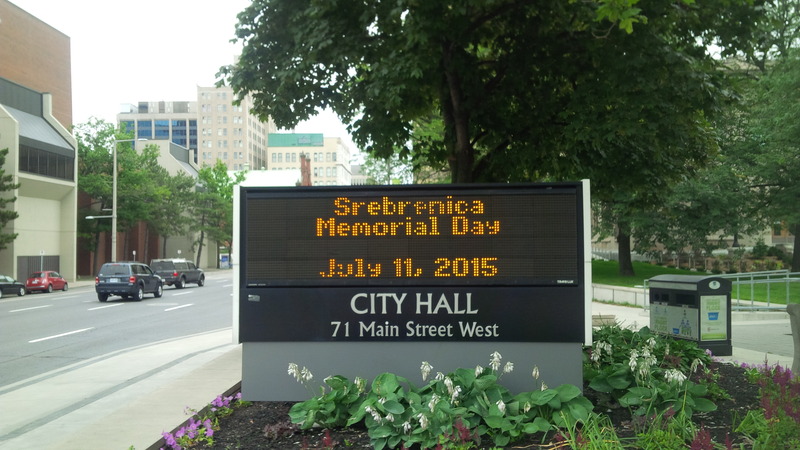 All Councillors of the City of Hamilton will receive a flower and shirts Srebrenica.